Paperback Writer: How British Are You? Yes, there is an online test that will determine exactly how British you are. And yes, it's very silly. But if I have to post one more holiday-themed piece I think my head will explode. Must tell the cousins across the pond that they've been a bad influence on me. So how UK did you rate? Let us know in comments. How funny is that? You're American and got "British as they come" and I'm British and got "Probably American"! I guess that's because I drink coffee instead tea. I guess it helps that I lived in the UK for so long..."British as they come" for me too. I got "American as they come-check your passport." ^_^ I think it was the coffee in the morning more than anything else that sealed that label! I got "As British as Kevin Costner’s Robin Hood ... Which is to say, not very British at all. But you’re probably a much happier, more well-adjusted person for it." I think for the World Cup question they should've had an option like: "Wait? The rest of the world is interested in this soccer thing? Which everyone else calls football. But which isn't really football, duh." Obviously, I got "Probably American, check your passport." I have to admit that the new US passports are incredibly, and very embarrassingly patriotic, what with the scenes of cattle rustling and bald eagles and all on the inner stamped pages. 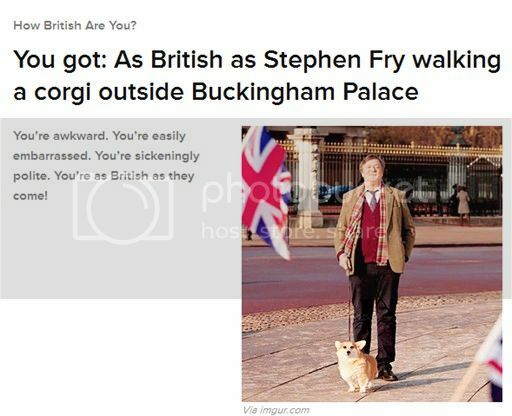 Maybe on the UK passports they need Stephen Fry walking a corgi! Make it so, captain.